West Woodlawn was granted tax increment financing (TIF) district status by the city in 2010. Yet TIF-directed development has been poorly received by the local nonprofit environmental group Blacks in Green, which has been advocating for community-based development projects since 2007. On November 21, the group held a forum entitled “Who Owns West Woodlawn?” to publicize the results of an extensive survey of the neighborhood’s development potential. Crafted by three Blacks in Green urban planning interns, the report shows that twenty-five percent of West Woodlawn residents have left the neighborhood since 2000. Over half of those who remain spend more than thirty-five percent of their income on rent. To answer the titular question of the forum, Blacks in Green offered a startling statistic: only forty-two percent of West Woodlawn taxpayers live there; the rest are either elsewhere in Chicago or out of state. 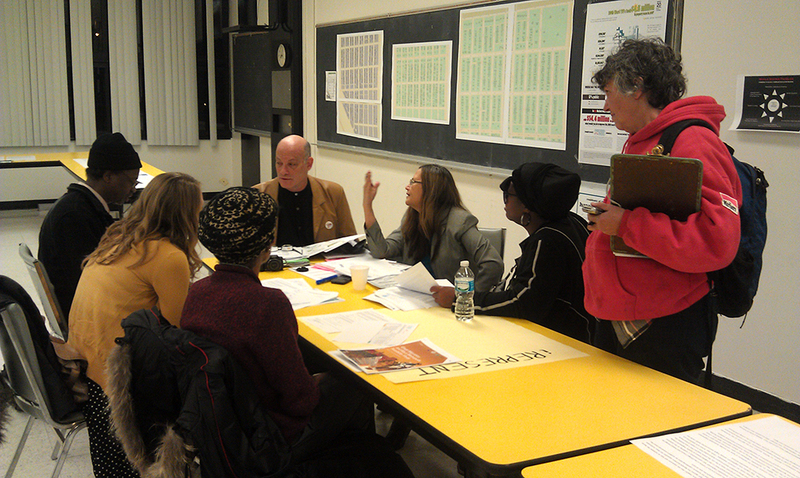 About sixty like-minded activists, experts, and residents gathered at Dyett High School for an hour and a half of presentations by Blacks in Green and Derek S. Hyra, and another hour of break-out sessions on reclaiming, developing, representing, and conserving West Woodlawn. In her welcome address, Blacks in Green founder Naomi Davis told the audience that her “question of the century” is “Where is your village?” Blacks in Green, like many environmental groups, she says, hopes that independent local economies might strengthen community spirit and allow for an escape from the environmentally and socially destructive forces of capitalism. Davis’s activism has been inspired by her grandmother’s accounts of the self-sustaining community she grew up in; she and the rest of Blacks in Green argue that if goods and services were all provided by locally owned businesses, the money would circulate dozens of times within the community of West Woodlawn and help grow its economy. Davis invited Hyra, an associate professor at Virginia Tech, to serve as the forum’s keynote speaker. He came to discuss the effects of what he calls the “new urban renewal” of Bronzeville. The city’s TIF-based plans for economic revitalization, Hyra said, come at a heavy political cost to the neighborhood residents. A “micro-level segregation” of a community results when development does not meet the needs of the current residents, but instead brings in wealthier residents who can afford the housing and have interests in very different services. The event did not shy away from strong rhetoric. Its bulletin announced that “billions in tax dollars have been invested to produce today’s West Woodlawn ghetto” through “race-based dispersal, market manipulations, government-sanctioned mortgage fraud, subsidized violence, guaranteed profits to slum lords, reduced community services accompanied by increased property taxes,” and other schemes. Hyra was comfortable providing community-based answers to these wrongs, like contractual negotiations between community leaders and real estate agencies and the construction of neutral spaces to which both native residents and newcomers are drawn to facilitate healthy development of a new community. Tom Tresser, the Chief Tool Builder with CivicLab, a nonprofit group for the promotion of civic engagement and government accountability, spoke about tracking government actions, including the City Council Plan Commission and Finance & Zoning Committees. The Plan Commission, as he explained, tends to approve everything the mayor puts forward, so residents have to campaign hard to secure any funding from TIFs.